Russia has a reputation for producing the world’s greatest chess players. For centuries, Russians have mastered the complex board game and dominated the global chess scene. With increasing frequency, they’re now doing the same thing in poker. Konstantin Maslak, a 30-year-old chess grandmaster from Volgograd, Russia became the latest champion at the 2015 World Series of Poker. He topped a tough field of 474 players in the $2,500 buy-in Omaha/Stud High-Low Split tournament, and ended up winning his first gold bracelet. First place paid $269,612, which was the biggest payday of Maslak’s poker career, which dates back to 2009. Maslak’s road to glory wasn’t easy. The tournament took four days to complete, extending into a fourth day of activity because of the late-night stalemate when play was three-handed. Maslak’s toughest opponent proved to be Hani Awad, an Israeli-born player who came very close to winning the second gold bracelet in a row for Israel. Idan Raviv won the previous day, which was Event 12. However, Awad couldn’t maintain his chip advantage the two times during heads-up play when he had Maslak down by more than a 2 to 1 deficit. The see-saw match resulted in numerous chip lead changes, lasting nearly two hours, with Maslak scooping the final pot of the tournament. This was Maslak’s 8th time to cash at the WSOP, which he’s attended three out of the last four years. Maslak has also enjoyed a number of cashes at major European tournaments since he began playing regularly about six years ago. However, he’s not achieved anything close to this magnitude. Maslak spends just as much time watching and betting on sports. He particularly enjoys soccer (football) and basketball. He even missed last year’s WSOP because he was so into the FIFA World Cup. This was Maslak’s third time to cash already at this year’s series. He finished in-the-money in The Colossus (Event o) and also min-cashed the $1,500 buy-in Omaha High-Low Split event. An interesting side note was the fourth place finish by Viacheslav Zhukov, also from Russia. He was aiming for what would have been his third WSOP gold bracelet, the most by any player from that country. However, Zhukov didn’t survive the third day and had to watch as his fellow countryman won the title. 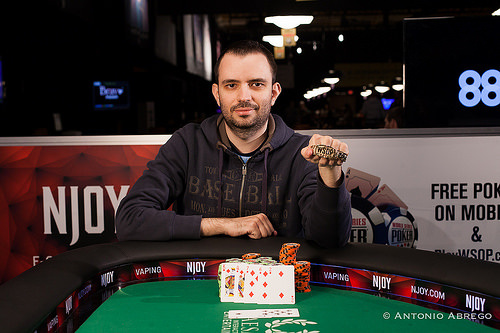 Second Place: Hani Awad took 2nd place, which paid $166,583. The Israeli-born player now living in Las Vegas now has 7 WSOP cashes. Third Place: Ben Dobson finished 3rd, worth a $105,893 payout. The poker pro from Nottingham, UK now has 6 WSOP cashes. 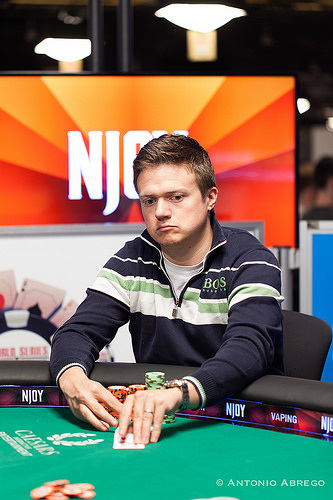 Fourth Place: Viacheslav Zhukov, a two-time gold bracelet winner (2011 and 2012) finished in 4th place, good for $76,357. He now has 11 WSOP cashes and in excess of $1.4 million in earnings here at the annual summer classic. Fifth Place: Kevin (Tuan) Vo ended up in fifth place, grossing $55,923. He is a 40-year-old poker pro originally from Vietnam and now residing in the Atlantic City area. Sixth Place: Brandon Paster was the 6th-place finisher. He is a mailman from Washington, DC and a gold bracelet winner from last year in the $1,500 buy-in Pot-Limit Omaha tournament. This time, Paster had to settle for $41,581. Seventh Place: Chris Birchby took 7th place, which paid out $31,379. He is a CEO who enjoyed his eighth time to cash at the series. Eighth Place: Jose Paz-Gutierrez rounded out the final table, finishing 8th. He earned $24,036 in prize money, his 11th time to finish in the money here at the WSOP. Paz-Gutierrez is an executive in a plastics company. Former Main Event “November Niners” Eric Buchman and John Racener cashed in this event, 10th and 37th respectively. Two-time gold bracelet winners Barry Shulman and Brian Rast cashed in this event, 17th and 33rd respectively. 1998 world poker champion Scotty Nguyen cashed in this event, finishing 39th. The average player age in this event was 44.1 years, considerably higher than the WSOP tournament average by about seven years. The gender breakdown was 458 males and 16 females. There were 75 players from countries other than the U.S. There were 31 first-time WSOP players in this event. Maslak has the bring in and Awad completes. Maslak calls and pairs deuces on fourth street. Maslak bets and Awad calls. Maslak bets again on fifth street and Awad calls. Maslak hits two pair on sixth street and bets gain. Awad thinks it over and folds leaving himself with just over one bet. He would get that all in the very next hand and the dealer would run the cards out. Maslak hits a king-high flush on sixth street and Awad is drawing dead. Awad congratulates the winner having finished in second place for $166,583. Maslak wins his first WSOP bracelet and $269,612. This is his eighth WSOP cash and third this year. Konstantin Maslak raises it up on the button, and Hani Awad calls. The flop comes down , and Awad check calls a bet from Maslak. The same action occurs when the hits the turn, and the river is the . Awad checks, and after about 30 seconds in the tank, Maslak checks as well. Awad can only muster up two tens in the hole, and Maslak shows for a set. With that, Maslak is down to just 700,000. Hani Awad was nearly all in a couple of times with pots that ended up chopped, but he just scooped one to get back up to 1.6 million. Awad raises it up on the button, and Konstantin Maslak three-bets it. Awad calls, and the flop comes . Maslak check calls a bet from Awad, and the same action occurs on the turn and the river. Awad rolls over for the nut low and a pair of sixes, and that scoops the pot. On the next hand of Omaha Hi-Lo, Maslak earned 3/4 of a pot when both players had the same six high straight, but Maslak held the nut low as well. Konstantin Maslak raises and Hani Awad three-bets. Maslak calls. The flop is and Maslak calls an Awad bet. The turn is the and Maslak calls another Awad bet. The river is the and Awad bets. Maslak thinks for a moment and then raises. Awad calls. Maslak turns over for jacks full of threes and Awad in disgust turns over for the nut heart flush. Awad would lose the next two Stud-8 hands and is down to just over a million in chips. Konstantin Maslak is in charge of the bring in, and Awad makes the call. Awad leads out on fourth street, and Maslak raises. Awad calls, and Maslak checks calls on fifth street. The same action occurs on sixth street, and Awad immediately bets seventh street when Maslak checks. Maslak checks his hole cards, then folds his hand. Awad rolls over to show nothing but a pair of fours, and Maslak nods his head as the chips and the chip lead go back to Awad. Hani Awad opens and Konstantin Maslak three-bets. Awad calls and the flop is and Maslak bets and Awad calls. The turn is the and Maslak check-calls a bet from Awad. The river is the and Maslak leads out this time and Awad folds. Maslak has started to pull away with almost a 2:1 chip advantage. Konstantin Maslak brings in with the deuce, and Hani Awad makes it two bets. Maslak reraises, and Awad makes the call. Maslak bets out on fourth street, and Awad raises. Maslak calls, then proceeds to check call bets on fifth and sixth street. Both players check on seventh street, and Awad rolls over for a pair of eights, which is good enough to scoop the whole pot. Awad would bet out on every street and Maslak would call. On seventh street, Awad checks and Maslak bet. Awad calls. Maslak shows for a queen-high straight and Awad shows for fives and threes with no low. Maslak scoops the pot. Hani Awad brings in with a showing, but quickly gets out of the way when Konstantin Maslak and Benjamin Dobson start raising it up. The money gets in on third street, with Maslak's kings ahead of the eights of Dobson. Neither player improves their hand until Maslak makes an unnecessary two pair on seventh street, and Dobson is eliminated in 3rd place. He will take home over $105,000 for his efforts, and we are now heads up in Event #13! Hani Awad raises from the small blind and Konstantin Maslak three-bets from the big blind. Awad calls. The flop is and Awad check-calls a bet from Maslak. The turn is the and again Awad check-calls a Maslak bet. The river is the and Awad leads out and Maslak calls. Awad reveals for a eight-high straight and a 2-5 low and Maslak mucks his hand. 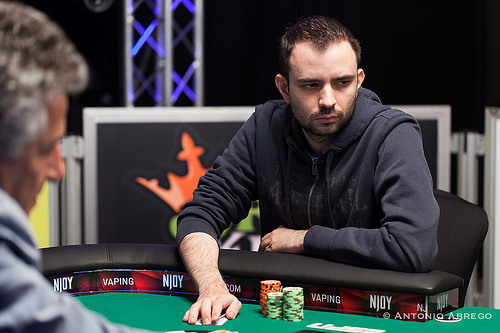 Hani Awad raises it up on the button, and Benjamin Dobson is the lone caller in the big blind. The dealer fans out a flop of , and Dobson check calls a bet from Awad. The same action occurs when the hits the turn, and the on the river. Awad tables for the nut low and two pair aces and sixes. Awad seems resigned to only taking half the pot, but Dobson check his hole cards a couple of times before tossing them face down to the dealer. With that pot, Dobson is down to just 225,000. An action packed Stud Hi-Lo hand has seen Konstantin Maslak take the chip lead. He bet on fourth street and was called by Dobson and Awad. Awad paired fives on fifth street and checked. Maslak bet again and was called by Dobson and Awad. On sixth street, Awad led out and was called by both his opponents. He bet again on seventh street and the action was the same with both players calling. Awad only had the pair of fives, Maslak showed for nines and sixes, and Dobson mucked his hand. There was no low and Maslak scooped the pot to take the chip lead away from Awad. 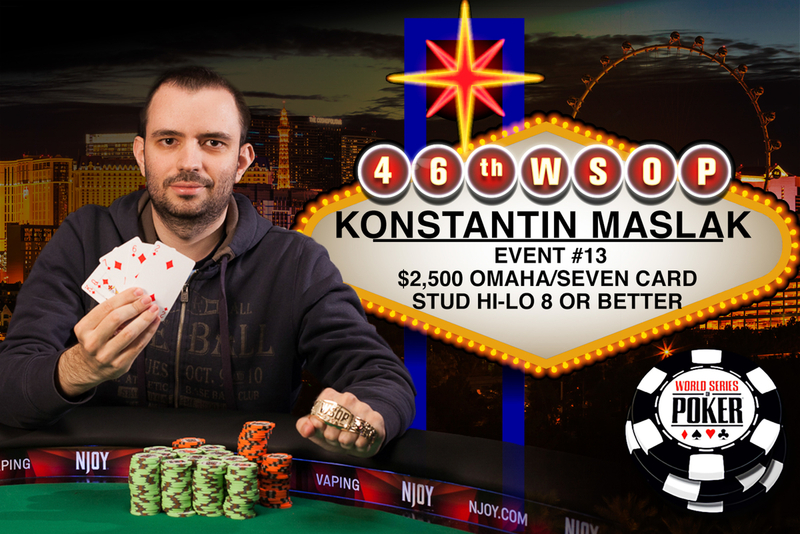 Konstantin Maslak took the last two hands of Omaha Hi-Lo off of Benjamin Dobson to almost draw even with him before this first hand of Stud Hi-Lo. Dobson brings in with the six showing, and Awad calls. Maslak makes it two bets, and Dobson raises it to three bets. Awad folds, but Maslak makes the call. Maslak then bets on fourth and fifth street, with Dobson calling both times. Both players check sixth, and on seventh street, it's Dobson's turn to bet. Maslak calls, and Dobson reveals for aces up. It's no good though, as Maslak shows the in the hole for a broadway straight. Benjamin Dobson raises, Hani Awad calls, and Konstantin Maslak three-bets from the big blind. Dobson and Awad both call. The flop is and Awad checks. Maslak bets and both his opponents call. The turn is the and Awad checks, Maslak bets, Dobson raises and Awad folds. Maslak calls. The river is the and Maslak check-calls a bet from Dobson who reveals for the nut low and a six-high straight to scoop the pot. After Hani Awad took most of the first few hands, Konstantin Maslak was able to draw blood and up his stack to over a million. Maslak raises first to act, and Awad makes it three bets. Maslak calls, and the flop comes down . Maslak check calls a bet from Awad, and the same action occurs on the turn. The river is the , and both players check. Maslak rolls over for two pair, and Awad flashes a king before mucking his hand.